i-insect | Races in Random Directions! Just like a crazy bug! Similar to keeping a pet mouse! 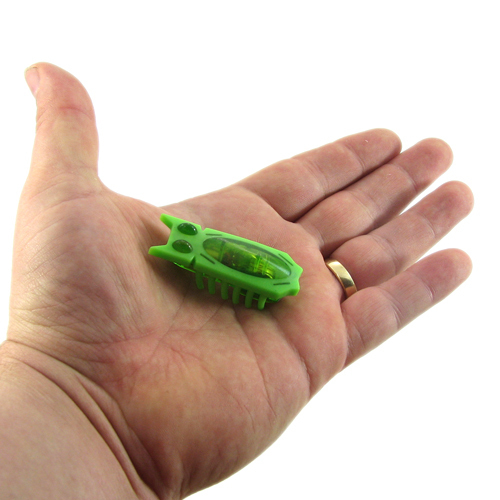 The i-insect is a small, fast, micro-robotic creature that behaves just like a real crazy bug! At 5cm long and 1.5cm wide, turn your bug on and watch as it shuffles around on its tiny, tickly legs! If you flip it over, the bug will roll back on its feet. It can even flip itself over at random! Keep your eye on the little fellow though, just like those pesky little bugs at home the i-insect will race around in random places and directions. With it's beady little eyes and pointy receptors, you may find it similar to keeping a pet mouse! There are six different colours to collect including blue, black, pink, orange, yellow and green (selected at random). Purchase an i-insect arena to keep your bugs in a controlled environment! Watch our video below to see the i-insect in action. We have also heard that the i-insect is great for children who are visually impaired so that they can hold the bug in their hands and trace it as it moves! Note: If you require a particular colour, please leave a comment detailing your selection(s) in the "order comments" section of your order. We will let you know if the colour your require is NOT available. Recommended for ages 5+ due to small parts. Switch it on using the on/off switch on the bugs belly. Requires 1 x LR44 button battery to operate (included).